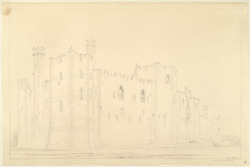 Edward I commissioned the building of a castle at Caernarfon in 1283. He had earlier seized the town, expelling all the Welsh inhabitants, in order to establish there his seat of government in Wales. The castle was constructed in such a way to complete the circle of a large defensive wall that surrounded the town. However, in 1294, the Welsh revolted against Edward and staged an attempted coup of the castle and town. They successfully breached the town walls and scaled the castle's defences. Although they managed to inflict major damage on the King's power base, they were eventually defeated. Edward then set about fortifying his castle further, thereby creating one of the most indomitable fortresses in Britain.